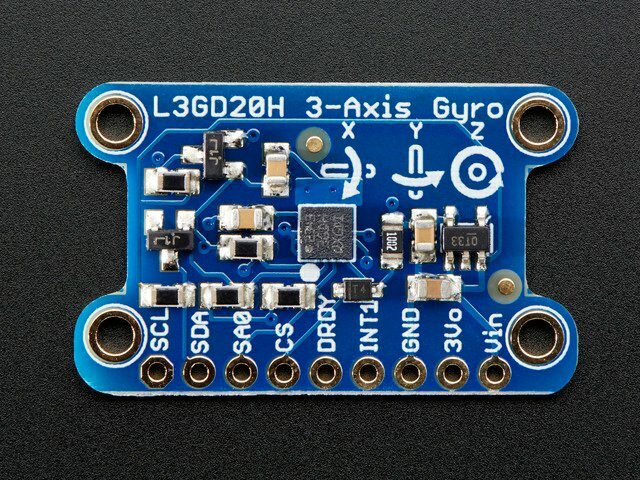 The Adafruit Triple Axis Gyro Breakout is based on the STMicro L3GD20 MEMS digital output gyroscope chip. We include a 3.3v regulator on board for compatibility with 5v controllers like the Arduino. And there are 4 holes so that it can be rigidly mounted. The triple-axis gyro sensor is a MEMS (Micro Electrical Mechanical System) device consisting of 3 micro-machined 'tuning fork' structures on a silicon wafer. These structures are designed to vibrate when stimulated by an electrical signal. When rotated about the axis of the tuning fork, the tines will deflect due to the Coriolis force. This deflection is proportional to the speed of rotation. The 3 MEMS structures are arranged orthogonally, on the X, Y and Z axis. Deflection on each tuning fork is detected as a change in capacitance between sensing plates built into the MEMS structure and converted to a degrees-per-second rotation rate for each of the three axis. For a more detailed description of MEMS Gyros, see MEMS Gyroscopes and their applications. and Everything about STMicroelectronics’ 3-axis digital MEMS gyroscopes. Gyroscopes are useful for many types of motion sensing applications. They are often paired with accelerometers for inertial guidance systems, 3D motion capture and inverted pendulum (e.g. Segway) type applications. The L3GD20 is particularly versatile, with three full axes of sensing, selectable ±250, ±500, and ±2000 degree-per-second sensitivity ranges and built-in high/low pass filtering. 3 micro-machined gyros with I2C, SPI and a 3v regulator on a bite-sized breakout board. This guide was first published on Jan 02, 2013. It was last updated on Jan 02, 2013. This page (Overview) was last updated on Apr 21, 2019.